So says Andrés Crespo’s security chief Cordova, attempting to reassure his anxious colleague Jorge as they leave a tense meeting with now Cali boss Miguel Rodriguez. Cordova continues by assessing that Miguel is paranoid about possible leaks that may have led to his brother Gilberto’s arrest last episode, and he’s not wrong. But he also, to the ultimate detriment of himself and his wife, underestimates just how far Miguel Rodriguez is willing to go to both stabilize his position and to shore up his shaky confidence in his own leadership. Last episode’s arrest caper story was so thrilling partly because its whiplash twists and turns threatened violence without ever spilling over into bloodshed. Not so, “MRO,” where Jorge (and we) are forced to witness the savage reality underlying the Cali Cartel’s manufactured image as the gentler, more reasonable alternatives to Pablo Escobar’s naked brutality. Summoned by a suspicious-sounding phone call to a meeting by Miguel’s openly contemptuous and reckless son David (Broad City’s Arturo Castro, erasing any trace of his Jaime’s sweet, gentle humanity from our minds), Jorge stops first at his daughters’ school, where he shares an embrace with them and wife Paola. Attempting to hold himself together on the drive to David’s isolated mansion meeting spot, he can’t reach Cordova, and is greeted on arrival with the sort of forced casualness that generally presages a surprise mob hit. (The furiously barking dog and the sight of the unsmiling Navegante regarding him from a high bluff don’t help his state of mind.) David greets him with customary gimlet-eyed challenge and leads him past a room with a crying woman inside to the pool, where a beaten Calderon is first suffocated with a plastic bag, then drowned. Jorge, who’d attempted to spare both Calderon and Cordova for their mistakes when reporting to Miguel, is then led to where a hooded Cordova sits bound and beaten. David reveals that Cordova and his wife (the crying woman) had been trying to flee the country—Jorge’s surveilled visit to his family had saved him. As Jorge pleads for his friend’s life (“He is a good man, and loyal!”), Cordova pleads with him to save his wife. David shocks Jorge (and us) by abruptly shooting Cordova, and Jorge, fleeing into the house, finds the woman bloody and very dead on on of the house’s beds. It’s a nightmarish sequence whose unsparing horrors only mount as Jorge is led from one violent spectacle to the next. When Miguel walks in and surveys the three dead bodies, Jorge (and we) may suspect some reproach to David, or remorse for the regrettable necessity. 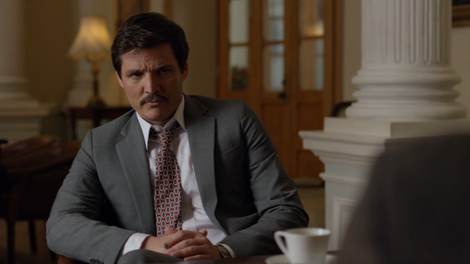 Instead, Miguel—seen earlier in the episode whiffing mightily at the simple task of reassuring one of the cartel’s skittish allies in the wake of Gilberto’s arrest—coldly tells the shaken Jorge, “Mistakes will not be tolerated.” Asking for renewed loyalty as he promotes Jorge to Cordova’s job, Miguel doesn’t appear to register how Jorge can’t bring himself to speak. Narcos’ portrait of its Colombia is that of a society so precariously held together that to attempt to redress one wrong inevitably causes—or necessitates—myriad others. Peña, called before another governmental committee meeting, bears up under the presiding general’s implied condemnation about how the DEA’s arrest of Gilberto Rodriguez most likely has launched another Escobar-style open war in the Colombian streets. “Maybe he can walk us through his path to victory,” taunts the general expertly, continuing, “So, Agent Peña, what comes next? The floor is yours.” Peña’s answer isn’t shown, but, contending with a complaining phone call from Feistl (with Van Ness, stymied by the government into essentially house arrest at the embassy), by telling the young agent, “You’ve gotta be creative.” (And reminding Feistl, “You asked for this. Don’t forget that—I know I won’t.”) And Peña shows his own gambler’s creativity, first approaching Kerry Bishé’s jittery cartel wife Christina Jurado in her hotel bar with a roguish effrontery that Christine allows herself to be mildly amused by, before revealing his identity and urging her to seek a deal. Rebuffed, he later comes to her apartment to try again, knowing from his illegal wiretap that Christine is deeply worried about how Gilberto’s arrest will impact her life and her marriage to cartel money-laundering whiz Franklin. The Feistl-Van Ness comedy team continues to pay off, Feistl’s reference to his partner’s ever-present “fanny pack of death” the episode’s funniest character moment. Miguel’s ineptitude at reassuring small talk is painful, as he takes Gilberto’s advice to flatter their suspicious associate by complimenting his shirt’s pocket placement. Gilberto’s baby-faced lawyer son Nicolas (Sebastian Eslava) proves more formidable than expected once he dives into cartel business (against his father’s wishes). Sitting down for a meeting with a suddenly balking politician ally, the young Rodriguez responds to the on-the-take official’s condescending explanations by resting his hand on his chin in expertly mocking rapt attention. Still, he can’t avoid giving the bad news to his imprisoned father that the old amnesty deal is dead, replaced with an offer that included major forfeitures of illegal profits—and three years’ jail time for the Gentlemen of Cali. In response, Gilberto ventures out into the prison yard for the first time—and the others prisoners begrudgingly part so he can hit the weight bench. Arriving at David’s house, Jorge hears GZA’s “4th Chamber,” whose lyrics (largely unheard here) touch ominously on both betrayal—and whether to follow the path of violence. 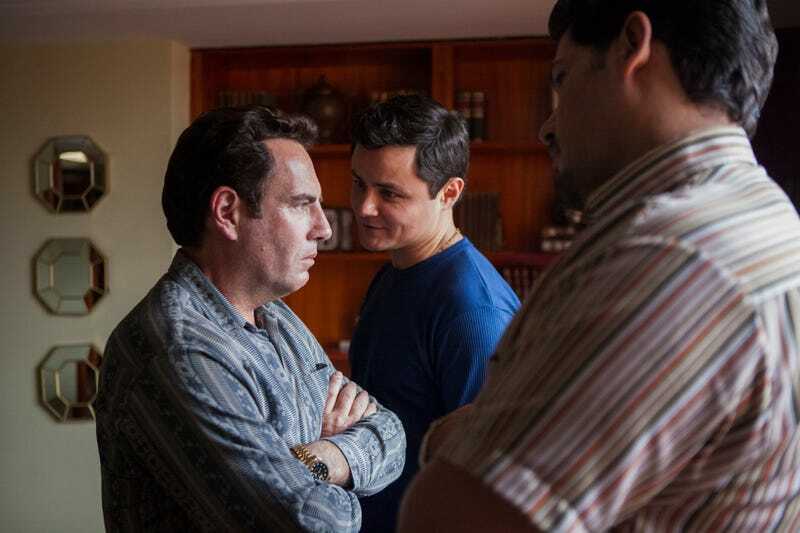 Narcos, Peña, and Martinez all go for broke in the exciting "Checkmate"